Borders Heritage Week (Sep 10 – 18, 2011) celebrates the rivers and coast with talks and walks on the rivers Tweed and Teviot, all the way down to St Abbs, Coldingham and Eyemouth. More information at www.doorsopenday.org.uk and www.archaeologyscotland.org.uk. 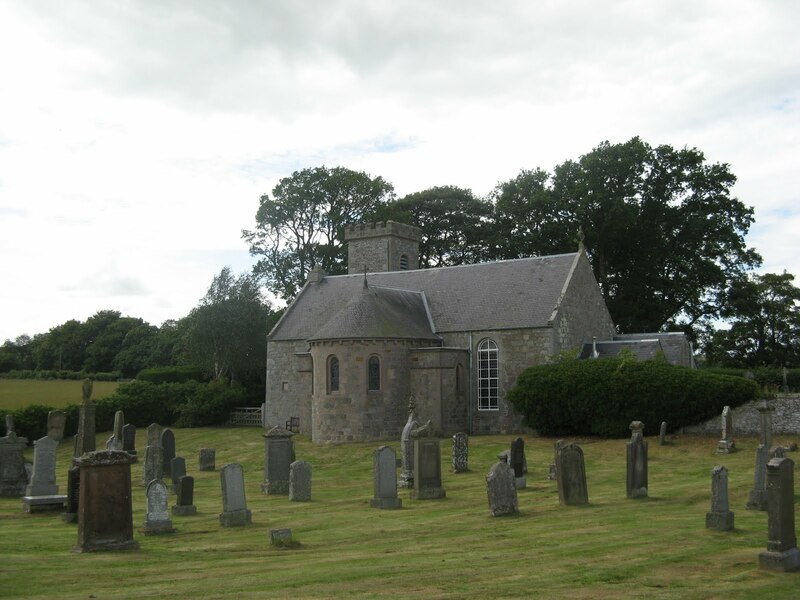 On Wednesday the 14th, there will be an open afternoon (2.00pm to 4.00pm) at the church, ruins and new garden at Coldingham Priory with informed guides at the medieval priory and the modern church (More information from Julia Carter 01890 771420). Last year, Borders Family History Society and the Friends of Coldingham Priory recorded the Monumental Inscriptions in the graveyard which surrounds the Priory. The MI is still a work in progress but we will be at the church during the open afternoon. As well as having the draft MI, we will have transcriptions of the names recorded in the Hearth Tax of 1694 and the Militia Lists of the 1801 for the parish. If you are researching your family history in Coldingham, please come along. If you can’t visit Coldingham on the 14th, there will be two more events on Saturday the 17th. The Priory will be open from 10.00am to 12.00noon. Contact www.stebba-coldinghampriory.org.uk for more info about the Priory opening. Scottish Borders Council Ranger Service (Tel 01835 826750) will lead a guided walk around St Abbs and Coldingham (11.00am to 4.00pm). I tried this out today, using the free access link to Swedish Records that I blogged before. I downloaded adonline2_installer-1.4.2-r610.exe and installed it. This produces only the Swedish version. The was no problem in installing it, but running it caused my Webroot firewall to crash. I found the Swedish version difficult to understand. I then downloaded the arkivdigital-installer-1.4.3-beta-r654.exe version and it installed fine, but on trying it, it too crashed the firewall. I restarted my PC and was then able to use it (and the firewall didn't crash). This has English commands and record type names but the record names have not been translated. There are no help topics in this version. The images are great, but what I hadn't realised is that the only information in the database is the type of record, and its name. I looked at Riksarkivets_ämnessamlingar, which I think means National Archives Topic Collections, and Skaraborgs_regemente (Skaraborg Regiment). So you can search by type of record and by place, but not by personal name. The images are very good and clear, but you have to read them and interpret them, and that's difficult, probably impossible, without a reasonable knowledge of Swedish and without a knowledge of old Swedish handwriting. However, if you can manage that, and you know which records are likely to be useful, then this is a great resource. Ancestry are offering free access to immigration records for Australia, Canada, France, Germany, New Zealand, United Kingdom, United States; and Swiss Overseas (not Europe) Emigration, 1910-1953. The United Kingdom records comprise UK Incoming Passenger Lists, 1878-1960, UK, Aliens Entry Books, 1794-1921 and England, Alien Arrivals, 1810-1811, 1826-1869. As is normal, with Ancestry's offers, you'll need to register if you haven't already done so. As it's the Swedish Genealogical Fair (in Google English ) this weekend (27 and 28 August) in Norrköping, Sweden. ArkivDigital, a Swedish provider of digital records is offering free access to Swedish records. Although my paternal grandmother was of Swedish descent and her grandfather spoke fluent Swedish, my father thought the family left Sweden in the 18th century, and he didn't know either the correct spelling of his great grandfather's names or the region from which he came, and both are vital when researching Swedish family history. However, one day, I hope to discover that. Meanwhile, if you have Swedish ancestry, as many Scots do, I hope this may be of interest. You will need to register, download and install their software, and whilst I have searched Google to see whether malware was reported I haven't seen any. Their website has a clean bill of health in Site Advisor, and isn't listed in Hosts Online, so I'm presuming that it's safe to visit and use their software. I'm certainly going to try it out. Do let me know how you get on, or whether you can help me, by clicking the 'comments' link below. This week-end (27th. and 28th.) August we shall be transcribing the stones at Lilliesleaf. Lilliesleaf is a very old Church which can trace its history back to 1116 although perhaps fortunately from our point of view we shall not be called upon to transcribe stones quite so far back although there will certainly be a number going back to the 18th. and 19th. centuries which will no doubt prove challenging. The transcribing of these stone is a vital service for family research as often information contained on the stones is simply not available from any other source and if not recorded is in real danger of being lost. Once transcribed the information with photographs of every stone and also other information pertinent to the parish such as the Hearth Tax, Militia Lists, lists of Ministers etc. is produced on C.D. and is available both to purchase and to view within our Archive. For a full list of the parishes/graveyards which we have transcribed to date see our Sales List. We shall be transcribing on Saturday between 10 and 4 p.m. and on Sunday between 1 and 4 and we invite anyone interested in helping to come along even for a brief period during these hours. Don’t worry if you have no previous experience in transcribing as full training will be given. Bring though a notebook and pen/pencil and also a soft brush and also optionally chalk, water and a kneeling pad. This is an opportunity to meet with other members of the Society who usually bring along a picnic so it becomes quite a social occasion. Lilliesleaf is situated about 7 miles north-east of Hawick, 7 miles south-east of Selkirk, 7 miles north-west of Ancrum, and 7 miles south-west of Melrose so very central for all these places. The Church is situated on the left hand side of the village approaching from Melrose. If you can manage let me know as this helps with organizing or if you wish further information please contact. Looking forward to a successful week-end and fingers crossed the weather holds. Our 50-50 Club has now been running for 1 year. There had been no winners up till last month, but last week that changed. The letters drawn were (in order) H M P.
One member had the same combination of letters but in a different sequence, so he gets the whole of the second prize fund of £55.25. The winner lives in Duns, Berwickshire. Not a bad return on his investment of £12 ! Of course, he, like all the other members of the 50-50 club, has supported the Society with his subscription to the 50-50 club. The 1st Prize Fund has not yet been won and currently stands at £55.25. You can join the 50-50 Club, too. A number of 50-50 Club members' subscriptions have ended and renewal invitations will be going out soon. The National Records of Scotland holds pension application and appeal records covering the period from November 1919 to December 1932 relating to Scottish soldiers and their next of kin who suffered from injuries sustained in the war, or died after the war due to injuries. Apparently, most World War 1 service records were burnt during World War 2 and it can be difficult tracing your ancestor's service during World War 1. If your ancestor suffered from a war wound, or died soon afterwards, then these records may be useful. Many of the applications were rejected, so even if your ancestor didn't receive a disability pension, it's still possible there's a record of him applying for one. Typical information comprises the name of the soldier, and the applicant's name, relationship to soldier, address, age, occupation, employers, rank, unit, date discharged, reason for discharge, pre-war service, service history from 1914 to 1921, date of the pension hearing, disability, appeal outcome, and pension amount, soldier's medical history. More information. (with thanks to Tunji Lees and Chris Paton). It's not as good as the offer for residents in Australia, New Zealand, Canada and the USA but it is still 10 free credits. Ancestral Scotland are offering UK residents 10 free credits when you sign up for their newsletter. Get your 10 free credits ! In 1940 after the evacuation from Dunkirk, Britain prepared for and expected an invasion by Nazi Germany - an invasion, which for reasons known only to Hitler, thankfully never materialized. As part of the British preparation for any such invasion Churchill ordered the formation of secret ‘stay behind’ resistance units. Personnel of the Home Guard and local volunteers were formed into top secret patrols throughout the entire country and trained to a high standard of efficiency in the use of explosives, booby traps, time-fuses, mines, and unarmed combat. These patrols were known as Auxiliary Units, which had approximately 3,500 members around Great Britain. They would operate from specially prepared underground bases set up countrywide. The bases were equipped and ready, the locations only known to those who would man them. One of these men was Bill Watson of Duns, at the time a joiner in the Town but later to join the Police Force in Edinburgh before retiring to Peebles where he died a few years ago. Others in the unit were Robert Simm, Ralph Buglass, William Forrest and Andrew Fortune all unfortunately now deceased. Prior to his death Bill Watson wrote a novel which was never published. This gripping yarn set in Duns relates to the formation and training of these units and also charts the revenge, sabotage and murder they delivered to the Nazis in occupied Britain. While of course purely fictitious it brings home only too well what might have happened. While names have been changed it is suggested certain inhabitants of Duns can still be recognised and the locations are exact and precise – the writer’s own home receives a passing mention. 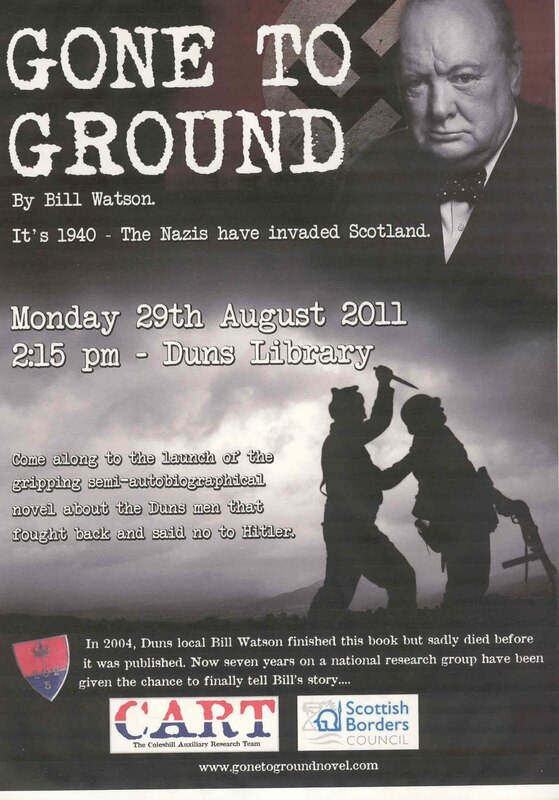 Coleshill Auxilliary Research Team – home of the British Resistance will be publishing the book which will be launched officially in Duns Library on Monday 29th August at 2:15pm. 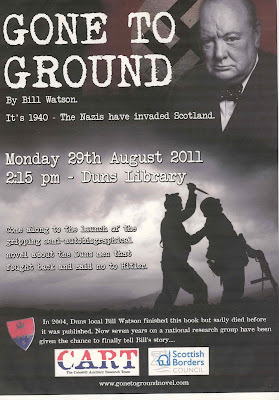 David Blair, CART's Scottish Information Officer, will be at the library to give a short talk and discuss more about the Scottish patrols and afterwards members of Dunse History Society will talk on Duns during the last war and there will be a small exhibition. The launch is open to all and a limited amount of books price £9.99 will be for sale on the day. Thanks to research done by Society members Davina Smart and John Murray living relatives of some of the members of the ‘cell’ have been tracked down and will be honoured guests on the day. Sir Walter Scott was born on 15 August 1771 in Edinburgh. To celebrate his 240th birthday, Abbotsford House which was his favourite home, is running two events on Sunday 14th August. No doubt, the income will go towards their restoration and visitor centre building project. Everybody gets the opportunity to go and picnic on the terraces to the accompaniment of live Scottish music between 4pm and 6.30 pm. The cost is £5.50 (kids over the age of 6, £3.50). If you don't want to bring a picnic, you can order one in advance from their tearoom. More info on the Abbotsford House picnic. The second event is a concert between 6.30pm and 8.30pm performed on traditional instruments. The concert will be held in the library at Abbotsford House and will be followed by drinks and canapés. The musicians are: Elspeth Smellie (Clarsach and voice), Christopher Keatinge (Accordion) and Matt Seattle (Border pipes, guitar, voice and fiddle). The cost is £20 (kids up to the age of 15, £10). If you want to go, I suggest you book early. More info on the concert. Ancestral Scotland is offering 30 free ScotlandsPeople credits, worth £7, to new users who are resident in Australia, New Zealand, Canada or the USA. You need to enter your name, email address, and post code, but it appears that you don't have to sign up for their newsletter, if you don't wish to. Sign up for your free credits. The first program is on 10 August at 9pm with EastEnders and June Brown. On 17 August we find out more about Harry Potter's creator, J K Rowling, and the following week, on 24 August, it's Sebastian Coe's turn. The fourth episode about actor, Larry Lamb, is on Wednesday 31st August. More in my blog New 'Who Do You Think You Are?' Series. Labels: JK Rowling, June Brown, Larry Lamb, Sebastian Coe, Who Do You Think You Are?